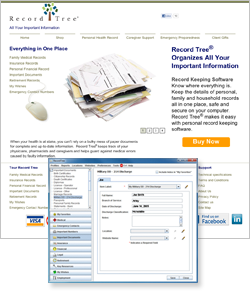 Record Tree® is a unique and long-awaited personal inventory software program that organizes and stores all of your vital personal information. Should you be unable to act on your own behalf, the essential details of your personal accounts, documents, and records are all chronicled clearly, succinctly, and securely—making for quick, convenient access. Everyone is going to need this sooner or later. Record Tree helps you and your family prepare for what can be a very difficult time. Learn more about Record Tree.